Understanding that a shiny new enterprise web application is not much use if employees refuse to adopt it, we are happy to share what we have learned regarding usability. Our emphasis is on helping engineers and developers deliver Great Apps from the moment they start developing new solutions for their businesses. To do that, there are some usability principles all developers need to know in order to understand what makes an app great! 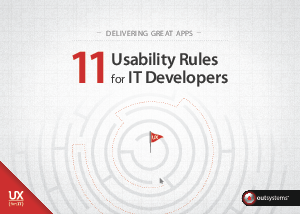 This book is about the 11 Usability Rules for IT Developers that we have identied and integrated into the OutSystems® Platform.